Do you know where your concept of time and money stems from? Chances are what you were taught as a child, and believed to be a concrete idea, is hurting both your personal and business life. Luckily this can all be changed. Time and Money are abstract ideas with concrete effects. This leads to a lot of confusion, and most people live in a scarcity mindset. So many of us believe that they have to protect their time and money, but in the end abundance isn’t the answer. To live a meaningful and prosperous life you need to really know the relationship between time and money. Both time and money need to be invested properly so that they can create more of both. On this episode of Creative Warriors we are joined by Sharon Spano. Sharon has written what I consider to be one of the top three most important books you need to read. She explains the importance of perception on these concepts, as well as really understanding where your ideas of money come from. Download this episode today and learn how you can shift your mindset and begin to live a more meaningful and prosperous life. 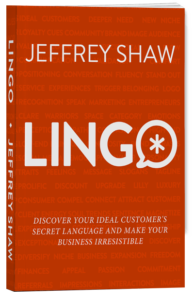 Pre-order your copy of Jeffrey’s book, LINGO: Discover Your Ideal Customer’s Secret Language and Make Your Business Irresistible here! Reconsider how you think about the relationship between time and money. You have to change your mindset instead of getting more tools. Many people act out of fear and scarcity. Humans, by nature, are always trying to prove their own theory. Once you become aware of it you can change it. Prosperity is a mindset. It’s a place to come from, not a place to get to. Wealth and abundance are relative. Time and money are both concrete and abstract. Everything you do has an effect on on your business and family systems. Look at your inner language. 12 Must-Have Mindsets for Uncommon Entrepreneurs! A FREE tool for Creative Warriors to help you get clear on the ways you need to think differently to get the results you want. We’ve been handed a whole bunch of malarky about who we are and how business works that simply doesn’t work for us. It’s time to set it straight! This tool will give you the insights you need to think your way to success as a Creative Warrior and keep you on track.